In a post-apocalyptic English countryside the lone surviving British hero barrels down the winding road in his trusty mechanical steed…or a storyline to that extent may describe the state of mind Panzani was in while developing this radical S-Type R. Eccentric car design has been a staple of this company for over 50 years and their latest creation based off a discontinued Jaguar model is no different. The company describes the design as vintage, mainly due to the shape of the head and taillights in series with the bumpers. 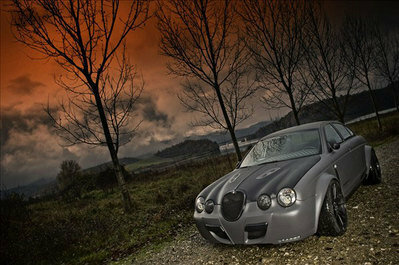 It truly is vintage Jaguar mixed with rally car and Audi RS6 all in one. Hit the jump for more details on the Panzani S-Type R Vintage GT. 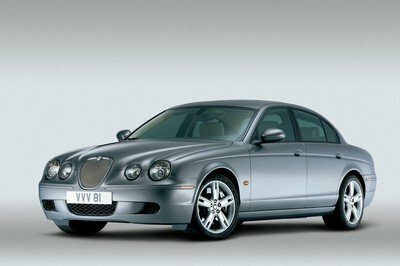 We have always been a fan of the Jaguar S-Type body, even though its run went on for far too long without sufficient updates. The original sedan brought Jaguar into the new century while retaining its British charm and XJ proportions. 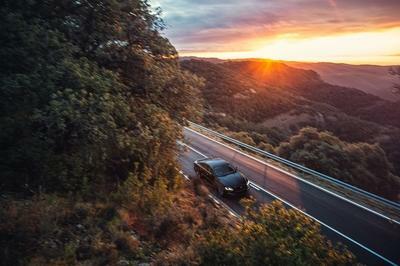 With the addition of a performance oriented model, Jaguar was able to attract some customers from the German brands that tend to dominate that segment. As Jaguar has dropped the S-type model in favor of more modern architecture, the real story for this model begins. From front to back, much of this car is new and custom designed in house by Panzani. The front bumper is much wider and taller than the outgoing one and features two large air induction sections directly below the inner headlight. Panzani left the quad headlights and mesh oval grille from the original S-Type R, but changed the hood to include mode air intake grilles. As the bumper wraps around it is clear to see that this is an extreme wide-body kit with huge wheel arches. These new arches help to cover 20” wheels shod in 255/35 R20’s in the front and 305/30 R20 tires in the rear. The widened stance and serious rubber contact points allow the Vintage GT to handle completely differently than a stock Jaguar. Even more performance oriented equipment can be found in the rear, where the bumper seems to be missing entirely. It has been replaced with the largest diffuser this side of aFerrari 599XX. Coming out from the center is a dual exhaust system helping the supercharged engine breathe. Most of the car is painted in a matte grey type finish, but several carbon fiber parts remain exposed. The hood and trunk lid are now lighter thanks to the weight saving aspect of carbon fiber and smaller carbon fiber mirrors are also in place on each side. If you are able to peel your eyes away from the exterior than the interior will also not fail to impress. 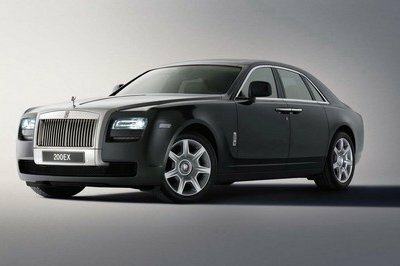 It screams British opulence, but also brings forth the sporty nature of this model. 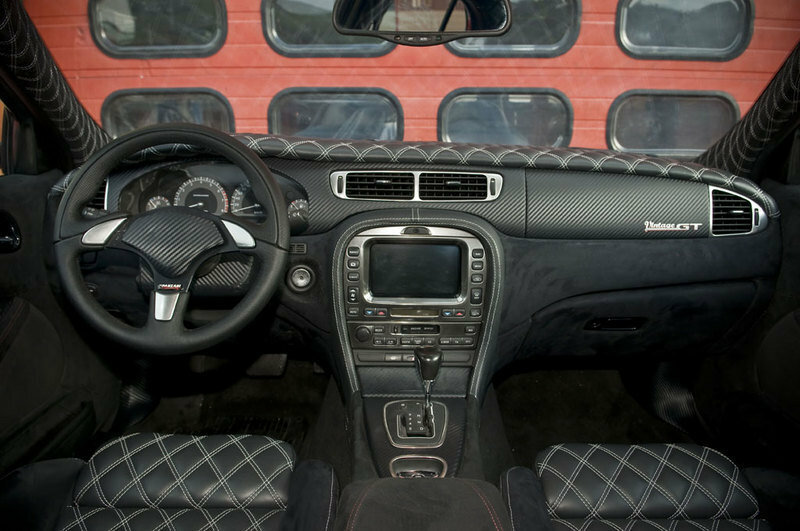 The center of the seats, dashboard, and A, B, and C pillars have all been covered in a diamond quilt black leather with white stitching. Surrounding that on the seats is black alcantara and some Panzani logos on the headrests. 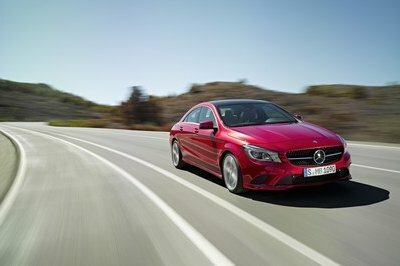 A three spoke sports steering wheel help round out the interior additions to an already loaded luxury sedan. 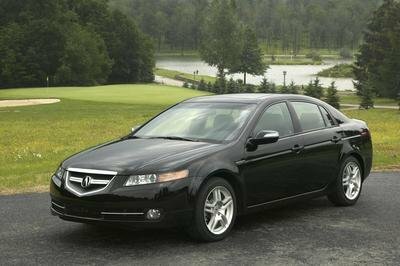 Factory navigation, dual zone climate control, power windows, and sunroof all remain. 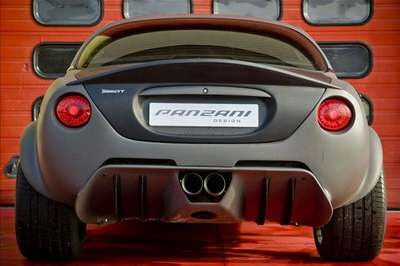 Panzani has been slow to reveal pricing for the car or to confirm or deny if they have made any changes under the hood. Undoubtedly the exhaust system will help the engine out initially, but the S-Type R is no slouch. It has a 4.2-liter supercharged V8 pushing over 400hp to the rear wheels. 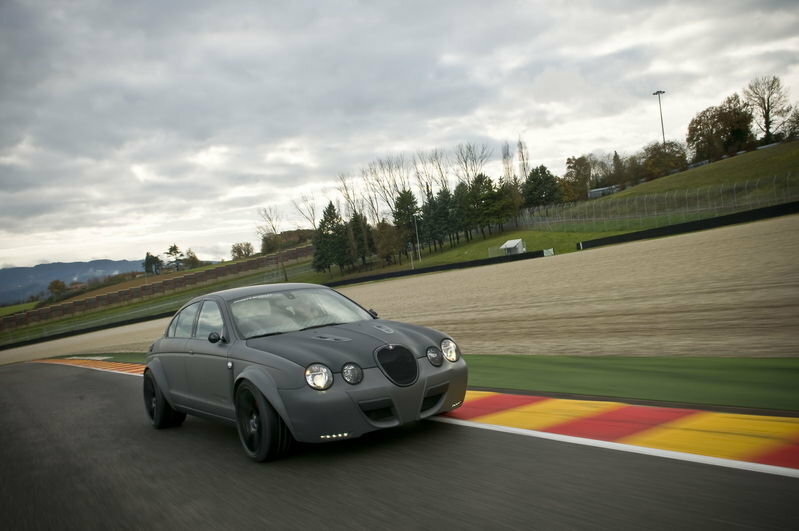 That engine in combination with the changes made by this tuning house make this one of the scariest Jaguar S-Type’s on the road. Its odd looking but cute. I will not agree that its ugly, yeah it’s somehow classic with its design. Every car has its own beauty and advantage, sometimes we just miss to see it. I like the smart and clever appeal of this S-type. Its odd-looking but cute. I will not agree that its ugly, but yeah it’s somehow classic with its design. Every car has its own beauty and advantage, sometimes we just miss to see it. I like the smart and clever appeal of this S-type. Clever and smart looking car, a bit of futuristic dynamic type. I do like car with extent that its very customized and advanced. With a glance you will be impressed. I think it was the design for the front that makes this car look odd. However, the aesthetic looks luxurious and aggressive. One thing that I can say about this one is that it is very classy. All of the add ons that they installed actually blended in pretty good with the car’s features. I am not really into these tipes f ride, but there is something in this S-Type that would make me want to look closer. Maybe it’s the matte black finish. Well, what can I say, this car is definitely one of the more elegant takes on the Jaguar that I have seen thus for. Certainly makes the car stand out more. I really love the way this one looks, they were able to retain the classic feel of the car while still being able to add new elements to it. Good thing that they also upped the engine performance. This one actually looks rather odd in that gunmetal type paint. But the front of this one certainly looks cool, definitely Jaguar-ish. Actually, its not outdated but rather "classic". Jaguar tries to combine the classic and modern style for the S-Type. The matte color is great and its dual exhaust. However, I think they need to improve the front. I don’t like those headlights and grille. The nose on this one actually looks like that of the Alfa Romeo 4C GT. But it also still has quite a lot of features that make this on we rather unique.